Hey everybody! 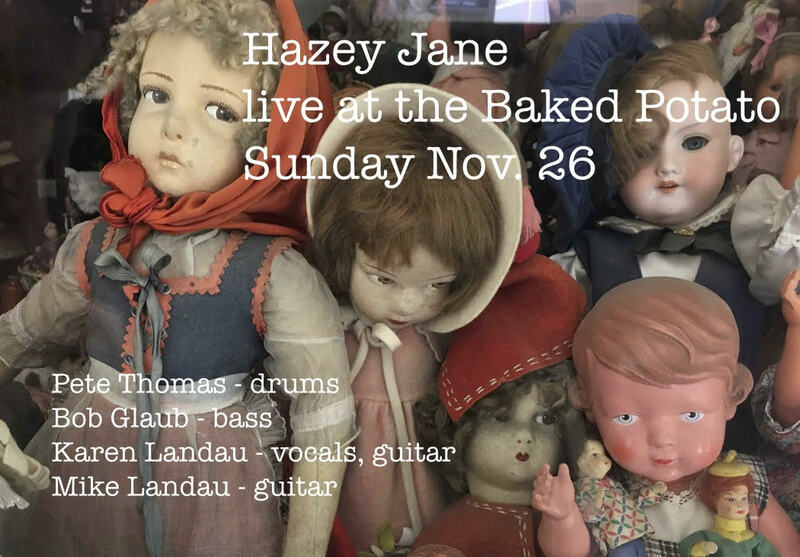 Pre-Thanksgiving Hazey show coming up Sunday, November 18th, 2018. Check out the flyer below! Advanced tickets available at thebakedpotato.com. See you there! 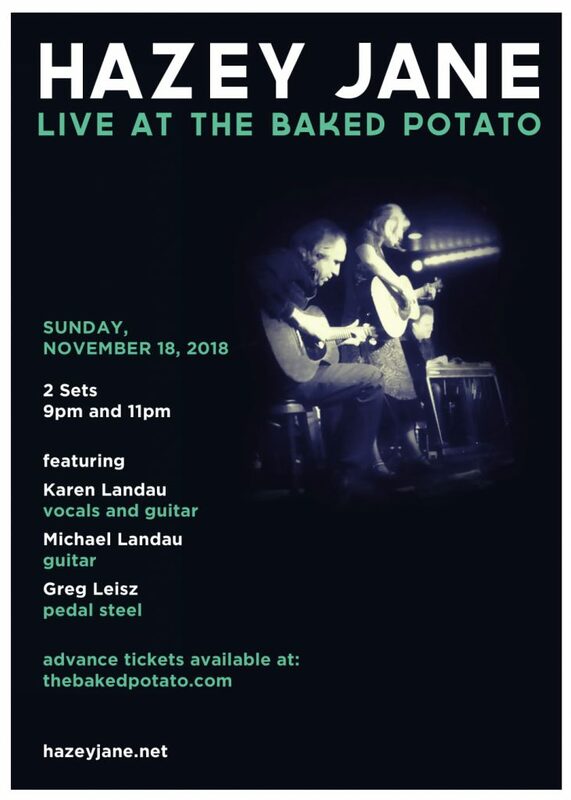 Live at the Baked Potato! Thanks to everyone who came out and supported our 2017 Rowan’s Roses Benefit – it was so much fun!!! Dustin and Trevor Boyer’s performances made it extra festive – thank you to them and all their fans for coming out too. Together we raised over $1,700 for research into a Cure for Cystic Fibrosis. Rowan’s Roses Team raised over $7,000 altogether this year. Thank you also to Leslie Nitta for the best homemade cookies EVER and to everyone who donated online from all over the world. Hazey Jane fans RULE!!! Hazey Jane is going to be playing a post-Thanksgiving show on Sunday, November 27, 2016 at the World Famous Baked Potato in beautiful Studio City, California. Come on down and sing along with us!! 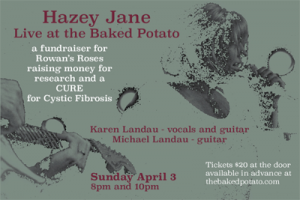 Thank you to everyone who showed their support for the Rowan’s Roses Benefit in April. With everybody’s help, we raised $1490 this year to help fund a CURE! And we had a really good time at the Baked Potato. Roses were everywhere. We even had a beautiful surprise by our friend James Carrington. Yay team! Thank you to all who donated online and those who came out to the show. 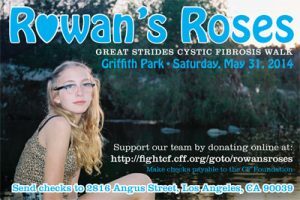 The proceeds will benefit the Cystic Fibrosis Foundation through our friend Rowan’s team which is participating in the “Great Strides” walk, raising money for Cystic Fibrosis research. Click on this link to donate any amount, no matter how small. Thank you! New recording in the works! Michael Landau on guitar, Andy Hess on bass, Charley Drayton on drums, Greg Leisz on pedal steel! Yay! All new songs by Karen… can’t wait to share with you! We’ll be performing live at the Baked Potato Sunday, January 17, 2016! Greg Leisz on pedal steel, Michael Landau on guitars, Reggie Hamilton on upright bass, and Karen singing and playing her favorite Martin acoustic with a new Sunrise pickup like Keith Richards has! We’re excited to be playing a “Stolen Fish” show at the Baked Potato on Sunday, August 23, 2015! We’ll be playing all the hits with the OG lineup – Makoto Izumitani on drums, Chris Roy on bass, Michael Landau on guitar, and Karen on guitar and vocals. Come on out if you can! Click here to donate directly to her team. Thanks to all who have participated in the past. 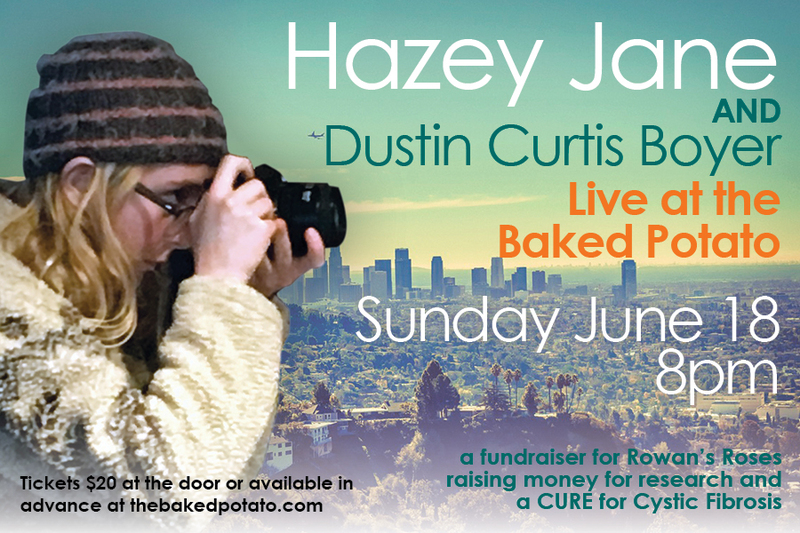 Although we were not able to schedule a benefit performance this year, we still want to support Rowan and help to raise money for important research into a cure for Cystic Fibrosis. The new Hazey Jane album “East Virginia and Other Folk Tales” is now available on 180 gram vinyl, CD and on iTunes! It’s a collection on folk songs I’ve loved since I was a kid – take a look on our “Music” page.